It's that time of the month again! Time for Elle's Studio April Kit and Inspiration Gallery Reveal! 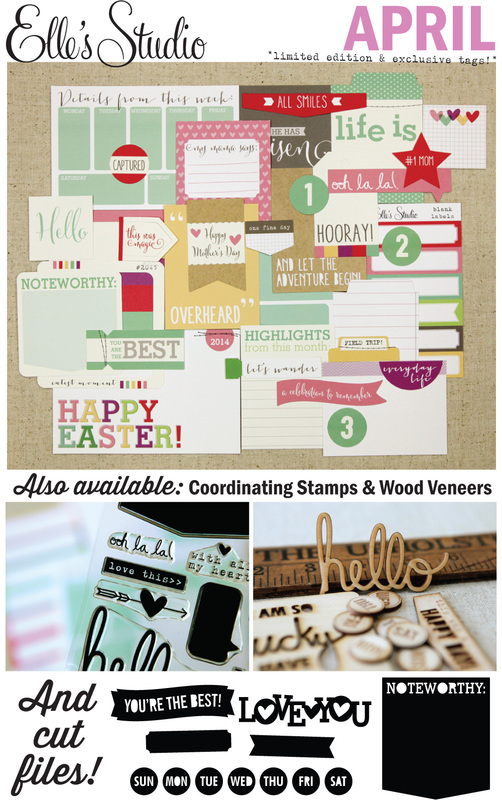 Every month, on the 10th of the month, Elle's releases an exclusive die cut and tags kit as well as other coordinating products such as digital cutting files, wood veneer and stamps! For this scrapbook page, I used a combination of the die cuts, tags, wood veneer, stamps and digital cutting file! I guess, I used a little bit of everything! The "noteworthy" pocket shape from the digital cut file caught my eye and I decided to enlarge it and create a background/frame for this darling photo of my nieces. This photo is truly noteworthy, in that it is nearly impossible to get a good photo of the two of them together. Even though they certainly love each other, I always struggle to capture those moments with my camera! I added some machine stitching to the edge of the pocket to give it a more realistic look and to add some textural interest. Then I layered on the die cuts and wood veneer. Finally I stamped a visual triangle with a few sentiments from the stamp set. And if you are looking for more Elle's Studio inspiration, then head over to the Elle's Studio Blog and check out the Design Team Inspiration Gallery! This is gorgeous!! LOVING the bright, happy colors and loving that sweet photo!!!! !